Hello and welcome to Hero Arts Holiday Blog Hop with A Blog Named Hero. Today we are showcasing Holiday cards using Hero Arts Holiday products. You should have come from Chitra Menon’s Blog. If this is your first stop in the hop, thats okay, I have the full list of designers participating in the blog hop towards the end of the hop. I have two cards for you today. My first card is a kind of one layer CAS card. For my second card, I have used the Holiday Petals and Leaves stamp set. I love Jennifer’s monochromatic layering technique. I stamped the images from the stamp set on a green card panel using green ink. Since this set does not have layering images, I used white gel pen to add my highlights. Then I stamped the sentiment from the stamp set in black on two strips of white cardstock. I also stamped the bow from the stamp set using red ink and cut it out. I adhered these on a vellum panel using foam adhesive. I then used foam behind the sentiment to adhere the vellum panel on the card panel. Finally embellished with Classic Christmas sequins from Pretty Pink Posh. This card panel is then adhered on a white cardstock. Here is a closeup. I love the tone on tone background on this card. Both the cards are simple and easy to mass produce. You can add gold twine to both of them if you like to take it to next level. Hope you like my cards. Your next stop is to Isabel Rivera’s Blog. Here is the list of all the designers participating in the blog hop. Make sure you leave comment on all the blogs in the hop. There are three Hero Arts kits to giveaway. Winners will be randomly choosen from any of the blogs. The comments need to be received by 11.59PM PST on Sunday November 22nd. The winner will be announced on Tuesday November 24th on Hero Arts Blog. Thanks for stopping by my blog today! Happy Hopping! Gorgeous cards! Stunning background on the first card! Both of your cards are simply beautiful! 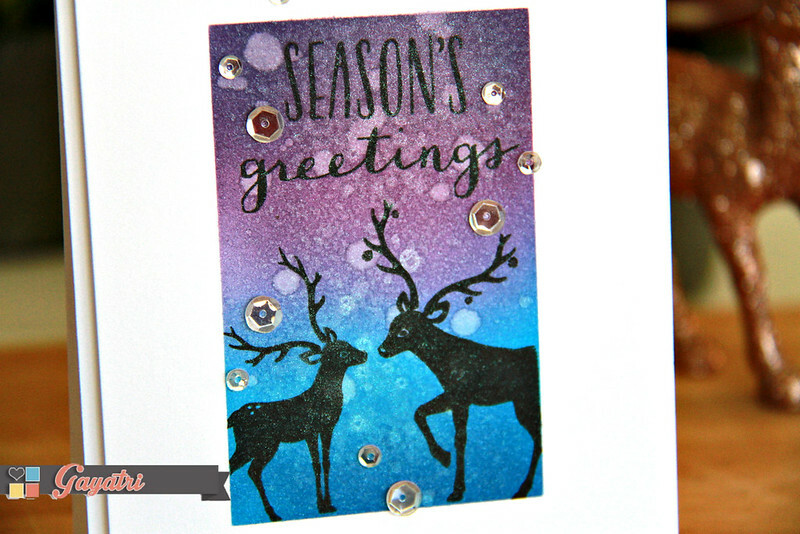 WOW – your reindeers look SO ELEGANT against your STUNNING, SHIMMERING background, LOVE IT ALL, SO MAGICAL!!! LOVE your tone-on-tone stamping with the white accents too!!! Both cards are lovely. Great stamping. I adore your first creation Gayatri! such a beautiful scene with shimmer and color effect and the other one is pretty too! The shimmer is just GORGEOUS on the first card! I love the coloring too! And the second card is so fun with the sequins! Your first card's ink blending is stunning! what a beautiful card! 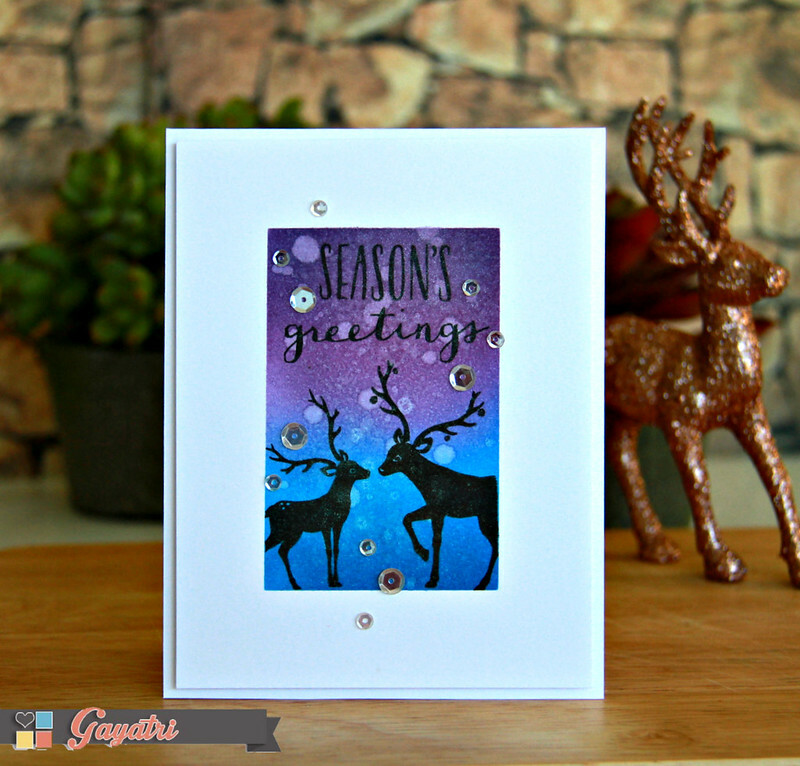 Fabulous – I really, really like the deer and blending of ink of the first card – nice job! I love your first card, such a great background and the deer look perfectly happy. The next card is lovely too. Great work. Stunning cards!!! WOW that deer card is gorgeous! Very pretty Gayatri! Love all the elements on both cards. Wow! The purple to blue background is amazing! Very pretty cards. So very pretty, Gayatri! Love them. 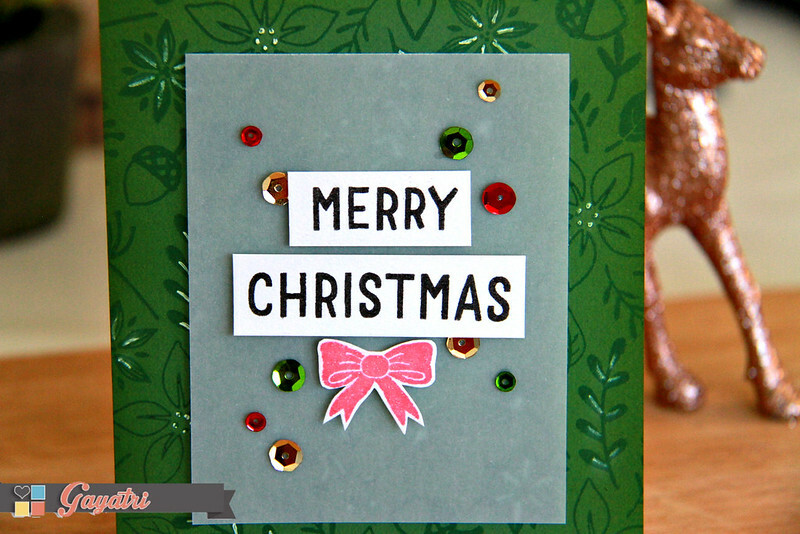 Love both of these beautiful card designs, Gayatri! Such lovely ways to use these stamp sets! Gorgeous! Your silhouette card is absolutely stunning! Love the shading of the background. Your blue & purple background is beautiful! Beautiful cards!! I absolutely LOVE the first card…beautiful inking!! Love the blues fading into the purples on your first card – just beautiful! love your lovely deer scene! Love this card! Loving the blue and purple! I love the monochromatic green background. Great cards. Love the deer background. Love both cards! On the second one the white on the monochromatic background really stands out! I like both cards, but my favorite is the deer. Beautiful cards Gayatri!! Love the scene on the first card!! The background is very beautiful in the second one! Beautiful cards, love the backgrounds on both, they look stunning! Love both cards! The deer card just screams “cold winter's night”! Beautiful! Great cards love the colors in the deer card. I'm in love with the gorgeous background in the first card! Awesome job on both your cards they are adorable! Sweet holiday cards! The blue and purple background is so pretty. I absolutely LOVE the deer card. The background is stunning! Beautiful cards. I love your masked creation – quite dramatic. Your second card was fun and cheery. Very nice card – love your watercoloring! I love your card with the reindeer. The colors are gorgeous! What a gorgeous background on Card #1 — spectacular! Use of the white gel pen on Card #2 produces very effective highlights. Hi Gayatri ~ Your first card stole my heart. I'm a Distress Ink ADDICT and your blending is absolute perfection. There's truly nothing about this card that I did not love. Your 2nd card is fun and cheerful with it's bright and beautiful colors. Thanks for sharing your awesome talent. Love the background on the reindeer card. I will have to try that technique. Thanks for the inspiration. I agree with you about the tone on tone stamping, it really makes the card! Thanks for sharing both of your cards with us, I love the distress background you created on the first and the tone on tone on the second. You have inspired me to try both techniques myself. Wow these cards are gorgeous!!! I love the delicate touches of the gel ink to your stamped images on the second card, and love the soft and subtle effect you have achieved by using various DI on the first. Purples and blues are favorites of mine, too, Gayatri! That one really stands out as lovely!! Love the backgrounds of your cards, so gorgeous! Both the cards are gorgeous! Love the beautiful background on both. Beautiful cards. The distress ink/water coloring on your first card is really neat and I like the background you made on your second card. Both cards, beautiful colors and nice design. 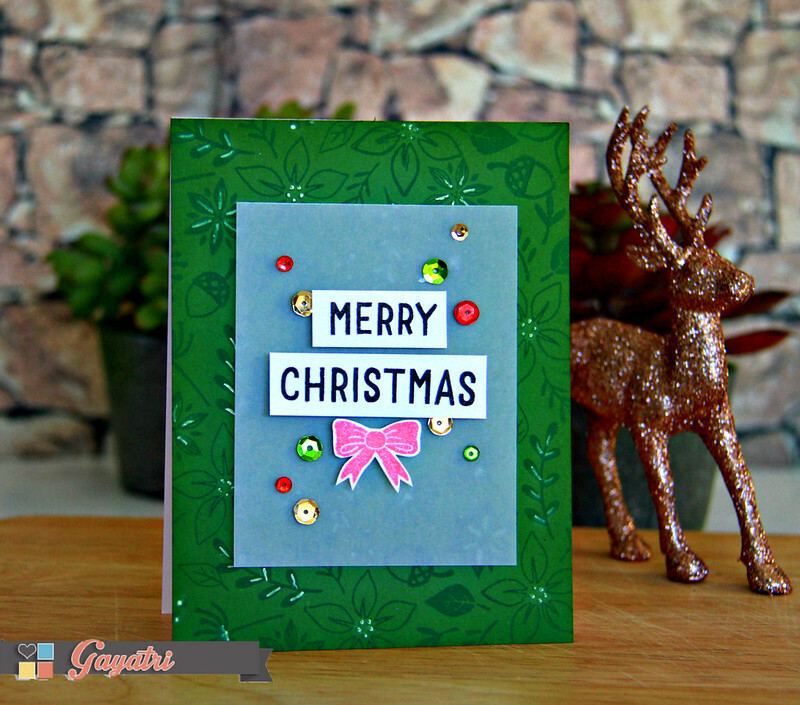 Gorgeous cards, Gayatri! The first one is so beautifully blended. The color combo of the second card is very pleasing. The first card reminds me so much of the Bambi film. Beautiful set of cards, the first one is simply gorgeous with that lovely inking, and the second one just pops out with that green background. That background is just beautiful! i like how you used black ink for the deers as well as the sentiment. and i love the sequins and the tone on tone background on the second card. both cards are very pretty. Really love the background colors and technique on the reindeer card! Stunning! Very pretty cards. The deer card is one of your bests! Beautiful cards!!! Love both of your backgrounds-both are so fun!! Lovely cards! The reindeer card is awesome! Very pretty cards. I love the background you created on the first card, and I always love tone on tone backgrounds – the effect is so simple but adds so much to a card. Thank you for sharing both cards! Awesome cards! Love the colors on the first card.. so striking! Great cards, I especially like the blending of the background on your first one! Two lovely cards! Wonderful backgrounds on both! Love he festive touch the sequins give! Two great cards. I absolutely love the background on the first card. Adding the white gel pen on the second card was just perfect. Thanks for sharing. Wonderful backgrounds for your CAS cards! Two very elegant cards. I love the silhouette deer! Pretty cards! I love the colors and framed look on the first one and the background on the second one. Thanks for sharing. Our hunters would love to find deer with antlers like those! I love your background on the second card. Love that gorgeous purple and blue background – stunning card. Great cards, beautiful colors. Thanks for sharing. wonderful backgrounds on both cards. Both cards are vey elegant and fun, but I like the tone on tone card the best. 2 Beautiful card's, just love the deer's!! Both cards are very nice. Lovely colors. Thanks for sharing. Such elegant backgrounds on both cards! I would love to receive cards like these. The background of the first card is awesome. Great cards. Stunning cards..Love the back ground in both the cards..
Love the background for both cards Gayatri! Both cards are so beautiful and so different…..